If I am to be honest, which is the first step to moving forward, I will admit am experiencing challenges with this within the black community. I love diversity and thinks its a strength. However it is nt always appreciated. On the one hand my desire is to be supportive, on the other I do not agree with many of the methods I see being adopted. I can accept that even if I am vehemently against some of them in principle. I respect the right of others to reach their own belief. My challenge is the underlying, unspoken mandate that there is one way to be black. Thinking outside of that “predefined” boundary is often despised and looked at suspiciously. I am sure their are thinkers, dreamers, many who dare, but I suspect they too have been silenced. My intense inner disagreement with manyprinciples have me silent, but present at one end and distancing myself at the other. I can respect that others make different choices. I simply detest that I am expected to adopt these viewpoints. I resent when others try to define how I think and speak… especially when it feel that these “expectation ” impose boundaries on growth. So how does one do “unity”, when you rae not equally yolked. Set goals that are about the WHOLE picture … In short unify my expectation for my future… not sure how I will do so but wanting to travel permanently needs to unite with running a company. my personal spiritual journey needs to impact my community and bsuienss relations! Business – I have slowly come to terms that a unified approach an ecosytem is needed to move forward. Over the last 11 years I’ve focused on one challenge at a time. Learning , trouble shooting, designing , testing theories through practice. Creating a formula that works but I’ve been hesitant to return to the concept of Tibiaetech without my partner, who passed away. On teh other hand we did so much work that it would be a dishonor to hs efforts not to take this further. I am already redefining all the various concept into “product services and merchandise.” However I plan to revisit them as part of a unfied whole rather than completely separate entities. Community – I have been thinking that try to become unfied with an open community is not an option. It has stagnated my growth. My late partner was right and I need to embrace leadership and not be passive aggressive about it! So I will seek to find like minded people … That means expressing and communicating more clearly where I stand and what I believe. It means sharing and speaking, educating others, so they can formulate their own opinions, but understand and respect my point of view even if they disagree with it! This site is a central location that holds my digital Identity and collateral together. I am becoming better at understanding how that works. organizing my multiple digital personas is the next crucial step. next year 2015 – I will create a unified dashbord to my varios interest – brands – personnas. A sort of digital cncierge that will make it easy for visors. I discovered that my contacts were not “individual interest that shared one email”, but rather One person represented by one or more digital contact points with a multitude of interest. My quest to unify and manage my conact list is ongoing. it just daned on me that Unity is about strengthen myself, becoming whole so that I can be a better person, asset, within a collaboration, collective or community. I highly recommend it , How can unity impact your life. 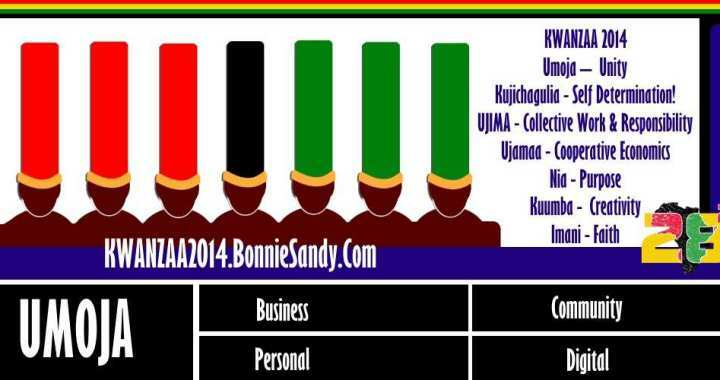 Posted in #kwanzaa2014, Latest and tagged #kwanzaa2014.